CALLING ON CHILDMINDERS IN COUNTY DOWN TO REGISTER FOR ‘BIG COOK, LITTLE COOK’ CONFERENCE! Open Invite to NICMA Annual Conference for Northern Ireland Childminders. Childminders from County Down are being invited to attend the free Northern Ireland Childminding Association (NICMA) Annual Conference on Saturday 29th September in the Armagh City Hotel. This year’s theme is ‘Big Cook, Little Cook: Healthy Active Lifestyles’ and celebrity chef Jenny Bristow has been unveiled as one of the star attractions. The conference will provide an opportunity for childminders to find out more about speech and language development, nutrition for childhood development, cyber safety and outdoor play. “The theme of this year’s conference concentrates on healthy eating and tackling obesity. These are real issues for society and one of the most effective ways that we can address them is to increase understanding and awareness of diet. “Earlier this year, we saw the introduction of the ‘sugar tax’ and yes, that is one measure that will influence consumer behaviour, but there are still a lot of misconceptions around the types of foods that are good for us to eat. The Big Cook, Little Cook Conference, which is financially supported by NICMA, The Public Health Agency and the Health & Social Care Board opens with a talk from the Public Health Agency. This will enable the sharing of best practice. 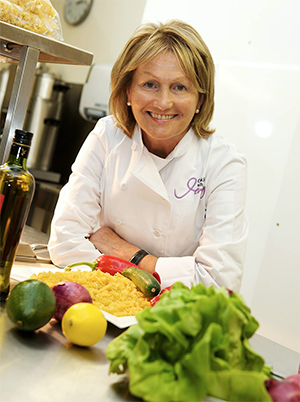 From 10.30am to 11.30am, and from 12 noon to 1.00pm, delegates will be treated to cookery demonstrations by celebrity chef and author Jenny Bristow. Jenny will show how simple ingredients can be combined to create tasty nutritional meals and snacks. Jenny added: “Very often meal times can become a pressurised environment. When you are rushing to make something quickly so that you can make the next school pick-up or trying to feed a child before they go to an activity, time is of the essence. In the afternoon, a series of workshops will be held exploring various child development related issues. Workshop places will be allocated on a first come, first served basis. To register your attendance at the Big Cook, Little Cook Conference, please visit www.nicma.org and complete an on-line booking form and return to NICMA as soon as possible. The conference programme presents an action-packed day of speaker presentations and workshops. Protecting children in the online world can seem daunting. It is a fast paced, ever changing environment, how are we meant to keep up with the risks that today’s children are exposed to? Should we discourage children from the online world? How do we protect the children in our care? And is it all bad news? At this workshop we will guide you through these questions. This interactive workshop will explore methods for engaging children in play activities. Participants will gain a better understanding of the need for play, to be creative and inclusive when planning, designing and implementing play spaces. * Managing risk in play.